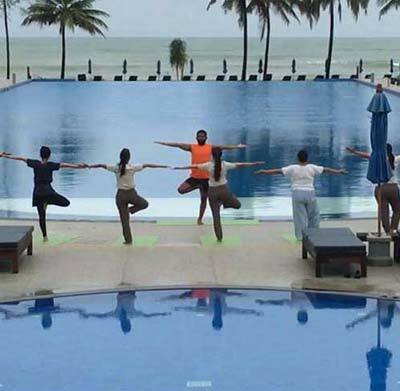 Join us for a luxury yoga and wellness retreat at the five-star resort Phuket Thailand. This is originated with the concept to pass on the story of the beautiful land of Takuapa City through its valuable architecture & traditional culture. The perfect ambiance of the resort that is inspired by the simplicity of the Morgan Village among the natural atmosphere, beautiful white sandy beach, waves, endless blue ocean, is the perfect place to relax, nurture harmony, immerse yourself in nature, yoga practices & so much more. After 5 days of yoga, meditation, healthy vegetarian food, rest and relaxation your body will feel rejuvenated, your mind will be clear and you’ll be radiating awesomeness. Immerse yourself in the healing and rejuvenating benefits of yoga with daily practice of postures, breathing techniques, guided relaxation and meditation, as well as nourishing your body with organic vegetarian food. You’ll learn correct alignment for your favorite yoga poses and discover local culture and traditions and have plenty of time to read or relax by the beautiful swimming pool & ocean.Our expert team of teachers & staffs take pride in making sure every moment of yours during our retreat , will be enchanted with the five-star perfect harmony of rich nature and ultimate comfort.This 50 hour retreat style training program is perfect for everyone to have a chance to gain a deeper understanding of yoga practice and to integrate a more therapeutic, individualistic approach into practice . Yoga teachers, current trainees can use the hours toward their registration. This 50 hour certificate will help you for upgrade your 100 hour and 200 hour certification. For couples or if 2 student will reserve together then price will be 700 USD for each. 8:00 pm to 8:45 pm Satsang/Video show/According previous notice. You can reserve your space with deposit 420USD (20USD for PayPal commission ) by PayPal account.This reservation fees is not refundable. Rest course fees you can deposit after arrive at our place by cash or USD, EURO, Pound or Thai baht (amount according to the Exchange rate on the date of payment).